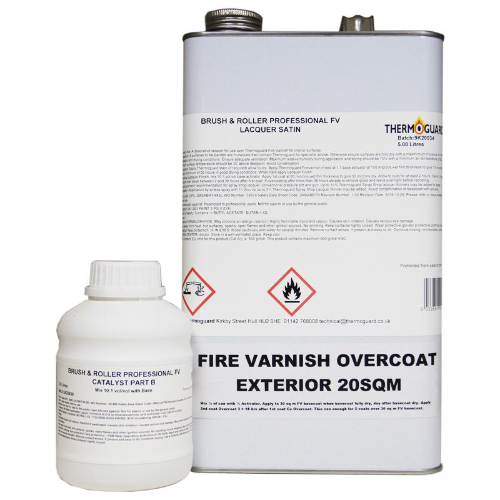 Thermoguard Fire Varnish Exterior Overcoat is a clear intumescent, fire retardant coating that is the second coat of a 2 coat system for the decorative fire protection of timber, wood & timber derivative substrates. 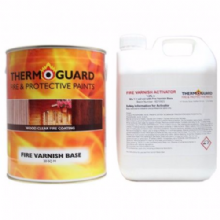 Please see Thermoguard Fire Varnish Basecoat. The systems special formula provides a tough, durable finish to joinery & timber. The clear finish enhances the natural beauty of the substrate while fire protecting new and previously varnished surfaces. The protective Fire Varnish Overcoat provides protection against UV and wear, while offering a choice of sheen levels. Thermoguard Fire Varnish achieves Class 1, Class O, EN Class B and can also achieve 30 minutes and 60 minutes Fire Resistance and provides Low Smoke Emission. BS 476 Parts 7; Class 1 surface spread of flame. BS 476 Part 6; Achieved – Fire propagation. A Fire Certificate of Supply is issued upon request for each correctly specified project for insurance, Fire and Building Authority and Client Records against proof of purchase.